Here are the changes that will be made in the new survival! -in centrixpvp.eu/l/vote5 or vote4 it sometimes said "you already voted today" or even when it said "your vote has been accepted"
I assume MineCraftServerList is a premium serverlist yea. Its good to hear that I found this in time for the big switches. I loved this server a lot then lost track of it for some time. Personally I think it is impossible to know what the community wants for every server when you're resetting on your own. Which is why we've recently used heads mainly to maintain their server, shape resets & to stay up to date of what the community needs. We will also be moving our focus from games towards our 'freebuild' gamemodes. This just because the original success of CentrixPVP came from those servers (together with EggWars, but that was mostly a 'hype'). Ever since we switched our focus more towards games, our freebuild servers have been lacking maintenance & dedication. First, I want to apologise for the people who would have won the top voter rewards, as we are not giving the topvoter rewards for the last 2 months. The actual TopVoters were not stored correctly, so we do not fully know who did win it. However TopVoter rewards will be back from this month! Aside from that, we are moving away from VotePoints, VotePoints were introduced to be able to claim multiple rewards in any server. The issue with this system is that it caused a decrease of votes and it providef difficulties with people stacking vote points for a server reset. From now on, when you vote, you will simply get your vote reward in every freebuild server, instead of only one. With this, we hope to encourage people to vote, and with that, we hope to increase server publicity. SkyWars hasn't been changed in over a year, the spawn even still is griefed from when WorldGuard broke, and that was months ago. SkyWars is the first server in our TODO list, so expect this gamemode to change soon! Skyblock is another server that hasn't seen a reset in over a year now. Even during the current iteration, Skyblock is just not up-to-date (this partially due to having inactive heads) and really needs a change / reset. Nearly the same thing counts for Survival & KitPVP, these servers are also planned to be reset, but are still in a very early stage. I hope you all are looking forward for the future! "CentrixPVP hasn't been doing that good in the past 1 to 2 years." If a mod is reading this, I'd like a reply if you can . It'll comfort me about this situation that has been taunting me for 2 years now. Thanks in advance if you're going to read the whole thing. It means a lot to me as a gamer. 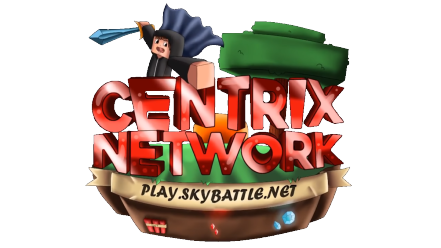 Back in October 2016 I was banned from CentrixPvP by the Co-Leader-SB "LarsLHansson" ( Idk if he's still a staff or not). I the reason of the banned was for PVP hacks in the Kits-pvp. Now here is the thing: I swear on my life I wasn't hacking. We were in a 1v1 while in the kits-pvp. I can't remember exactly everything but I believe he had full iron enchanted with prot with normal golden apple. I on the other hand had only leather armor and a stone sword. In that fight I was shaking, I was like yes, this is my chance to try to fight him. Of course (IDK how) I some how won the fight. I was so honored. I was like freaking out. The one thing I thought of though was giving him back his amour because I didn't really need or wanted it so I wanted to just return it to him. Not 5 secs later I got banned. Just after one fight. He didn't even confirm with me. He just said nope, he's probably hacking and banned me. LarsLHansson, if you are reading this IDK what to say man. I don't really have proof to defend myself but at the same time, you didn't really have evidence against me either. Sure I won one fight with you and no lie, if somebody did that with me I'd be suspicious too. I tried Apealing to you but you turned me down. All I have is a screenshot found like 2hours before the fight/ban. March 2017: The thought of me getting banned for something I didn't do haunted me for along time. I was like, is there any chance I'd get unbanned? I logged on and for some odd reason, I was unbanned. I told a staff but they just said "It's fine, just play the game." So I guess for some odd reason I was unbanned. I guess this is behind us now so I shouldn't really care. Deep in side it still haunts me though. If LarsLHansson is reading this, message me. I just want to be friends and get the over with. I'd get it. I don't want to blame you but if somebody did that to me I'd probably think they're hacking and ban the straight away. And thinking back to my Appeals: If you did banned me in anger, I understand you can't unbanned me. You'd get in trouble. LarsLHansson, if that was the case I'm not mad. I just want to be friends.